Katalon Studio is a simple and powerful automation solution built by KMS Technology for testers everywhere. Katalon Studio revolutionizes the use of open-source test automation frameworks such as Selenium and Appium by eliminating their technical complexities to allow testers to efficiently setup, create, run, report and manage their automated tests. It also offers a viable alternative to commercial test automation solutions that are unaffordable to many small and medium-sized teams. Test Object Integrity auto updates all related test cases and suites when objects change. enhancements and features that are the direct results of your feedback. 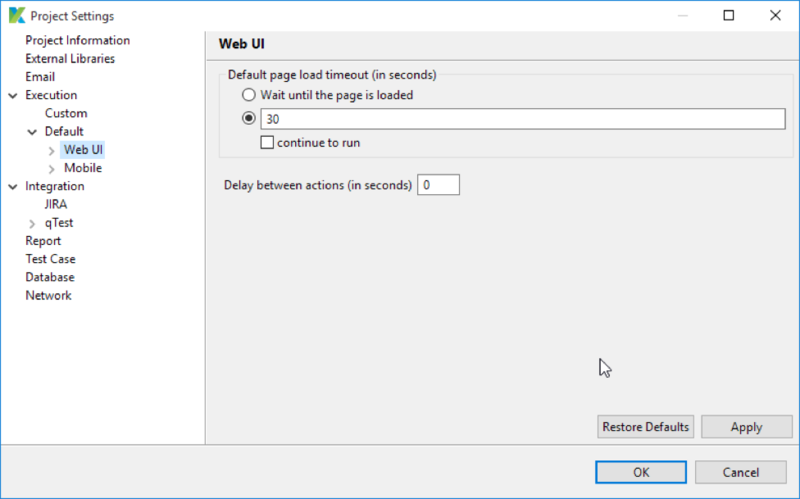 Option to specify the delay time between actions to adjust execution speed to the desired duration. Execution results can be exported in XML format that can be utilized with CI tools. Effective Debugging Shortcut to failed steps in logs views mode to identify the root cause quickly. 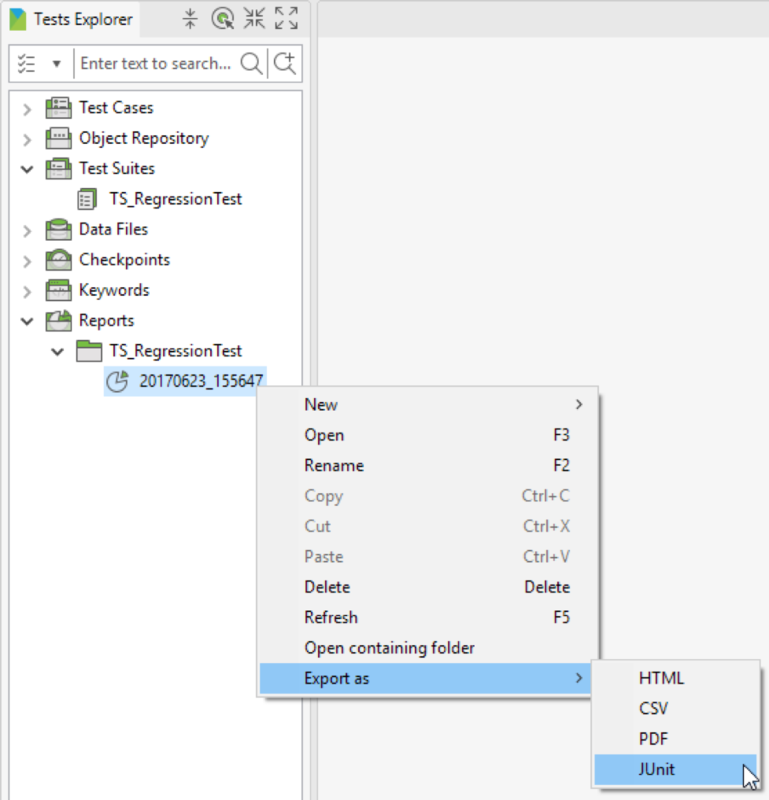 Users can quickly match test variables of the test case with a respective column of test data. Test step can be annotated using Gherkin language. The annotations will be consolidated as test case descriptions. Additional keywords are introduced for Web UI and Mobile. The Katalon Help page is updated to provide new users with three basic steps regarding how to get started with Katalon Studio quickly. Users can also specify the location to create their new sample projects as appropriate. Introduce Properties tab for Test Case. The read-only Comment field, whose value is extracted from Comment keywords, allows users to annotate their automation script for reviewing purpose. The below screenshot showcases how BDD and its Gherkin syntax is leverage to give a description of the test case. Thus, allow business stakeholders such as BA or PM to involve in the development process. 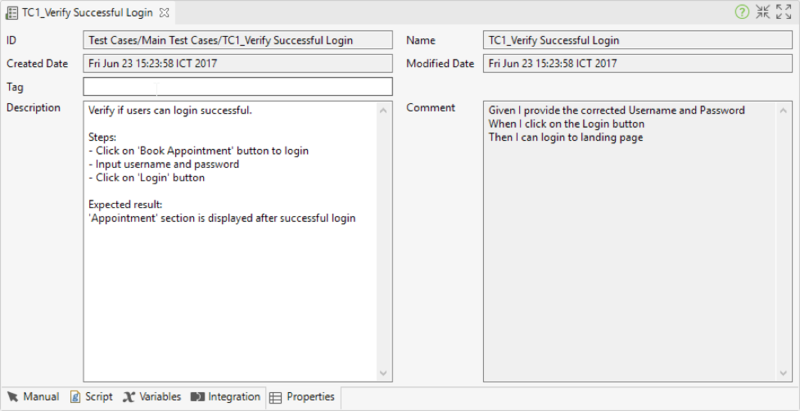 When viewing execution log in Log Viewer, users can now navigate to the respective step by selecting from the context menu. Allow execution of Test Suites to be generated as JUnit report in XML format. 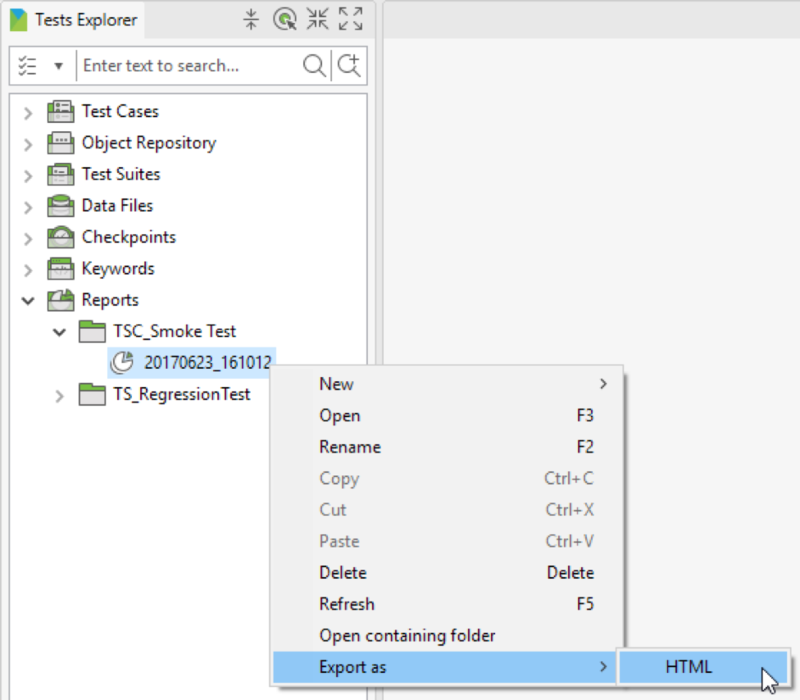 Execution of Test Suite Collection can now be exported to HTML format. Add Map All button to Variables Binding section so that users can quickly match test variables of the test case with a respective column of test data. Verify text of an element. Verify if all expected options are present within the given test object. Simulate users hovering a mouse over the given element with the relative position (x, y) from the top-left corner of that element. Simulates keystroke events on the specified element, as though you typed the value key-by-key. Those who do not have many experiences in automation test should download Katalon Studio. Having tried for more than 1 month and here are my objective opinions. + Record & Playback functions are quite good so I can quickly create new test cases. + The size of the application is somehow quite big. + Still slow when running a lot of test cases. Overall: Just heard about this tool while searching on some forums. 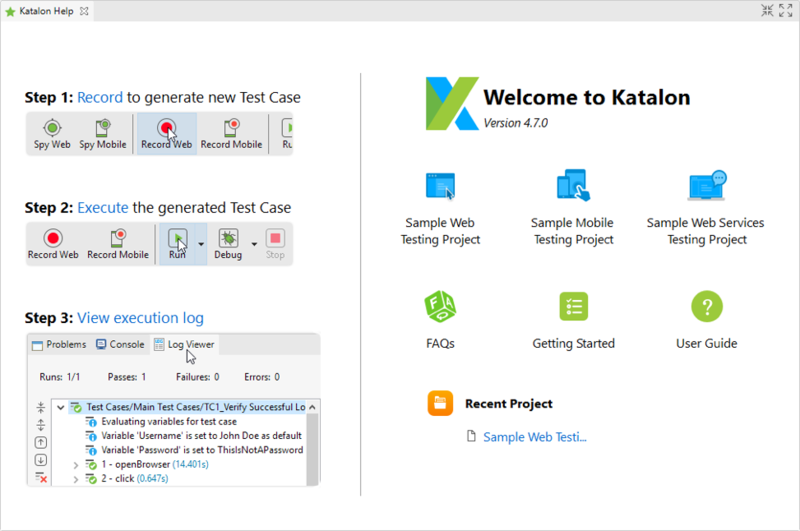 Since people said it's free and easy for manual testers to start automation testing, especially for Selenium/Appium users, I did download and try Katalon Studio for a couple of weeks. Thanks for the cool testing framework! Permalink Submitted by Helen on January 5, 2017 - 11:35. Simple to start up: simply visit their website katalon.com, create an account, download the package, and install it. The tutorials and user guide is good enough to help users start the app. Includes 2 modes for both new testers and expert testers. Based on Selenium and Appium, so it’s quite familiar to me. In general, Katalon Studio is a must-try tool for manual testers to start automation testing. Permalink Submitted by Linh Vo on January 12, 2017 - 10:30. Permalink Submitted by Linh Vo on January 12, 2017 - 10:34. Those who do not have many experiences in automation test should download Katalon Studio. Having tried for more than 1 month and here are my objective opinions. Record & Playback functions are quite good so I can quickly create new test cases. I also try to test my REST web service by Katalon Studio and I think it works perfectly, helps me a lot. The size of the application is somehow quite big. Still slow when running a lot of test cases. Permalink Submitted by Lan Vu on March 20, 2017 - 08:19. I currently check out this tool via my friends' reviews. I was looking around for more information since Katalon Studio is quite a strange name to me. Amazingly, I found it pretty useful for my project. Katalon Studio supports both web and mobile applications, but I prefer the first one as my current project is about web application. I think this tool helps Selenium (for web) and Appium (for mobile) become easier to approach, especially for those who do not have many coding skills because it has keywords and execution engines built on top of the Selenium and Appium web drivers. All frameworks and ALM integrations included in a single package allows users have a quick and simple deployment as well. In addition, the full feature set is ready for automated testing and friendly user interface allowing users to create, execute and manage tests rapidly. I heard people feedback the documentation, tutorials are not detailed. I experienced it too. But recently it seems like they have updated the library, there are some more videos for tutorials purpose which I estimate clear enough for users to understand and follow. However, I still wonder how an amazing tool as this keep being free. Most of the features you need for your project are free. Just recently they updated some other categories as test automation consulting and automation testers supplying supported by their company-KMS Technology (do not know the cost since I still have no further requirement). So if you don’t need consulting and experienced testers for your project, it’s totally free for you! I do hope they’ll keep it free for long time as the open source, the paid tools are somehow over the budget of small companies. One more thing, the community is actually not that big as Selenium or some famous paid tools. So you might find it hard to have many people running to you and helping you with your problems. But the support team is dedicated and fast, so you can count on them. I highly recommend this tool, it’s free, easy to use and powerful. The latest release (v4.5) is incredible! Permalink Submitted by Helen on March 23, 2017 - 07:32. Thank you for listening to our feedback. This is a an awesome alternative to expensive commercial tool. What is new with Release 4.5 ? Permalink Submitted by Siteadmin on March 23, 2017 - 07:39. Hi Helen, can you share what's new with Katalon v4.5 ? Permalink Submitted by Helen on March 23, 2017 - 08:25. The new version includes some UI improvements, Help links to the documentation, reporting bugs directly from the app, more suggestion from autocomplete, parallel execution to start multiple web tests on many connected mobile devices, and the Report UI is reorganized. Permalink Submitted by Lan Vu on March 23, 2017 - 09:25. Agree with you Helen, I checked out the new version since receiving the email this Tuesday. It's cooler than I expected. Feel like the develop team really listen to users' feedbacks and seriously think about it. Things I proposed finally turn up this time. Check it out yourself and tell people more ideas. Permalink Submitted by Siteadmin on April 30, 2017 - 07:19. What are the training options and availability in Chennai for Katalon Studio? Permalink Submitted by Siteadmin on May 4, 2017 - 17:22. As you have already known, Katalon Studio is a free tool and unfortunately, we don't have the resources for training at the time being but you can find video guides from this YouTube channel created by our users.